In 1909, the realization of the need for a campus hospital arose when an unnamed student died due to unavailability of medical facilities. President Kenneth Mathison appealed to Georgia Federation of Women’s Clubs for support. Georgia Federation of Women’s Clubs formed a committee and one of their members, Mrs. Joseph B. Whitehead gave the first gift, $5,000.00 to get the project rolling. In the midst of construction, they ran out of money and made a public appeal for money or materials to finish the job. Georgia Federation of Women’s Clubs had a bill presented at the 1911 General Assembly and an appropriation of $6,000.00 was made. The building was completed and a dedication was held on November 13, 1911. The Hospital could accommodate 27 patients and had suites for nurses, doctors and a small lab; it also had an isolation ward and sun room. This first Joseph B. Whitehead Hospital was under the supervision of a doctor who also had his own private practice, so a leading student from the Emory School of Medicine would be selected to run the day-to-day operations of the infirmary. One of the medical students chosen for that honor was Edward Roe Stamps III, and his time on our campus was the start of a long and fortuitous relationship between the Stamps family and Georgia Tech. Since 1911, Health Services has grown into a 40,000 square feet, state-of-the-art, outpatient ambulatory center that provides health care and health education to eligible students and their spouse/domestic partners in six areas: primary care, pharmacy, women’s health, psychiatry, health promotion, and support services (laboratory, radiology, immunization, and eye exams). On average, Health Services physicians treat 30,000 patients per year. Watch our welcome video to learn more about Stamps Health Services. Stamps Health Services is open Monday through Friday with the exception of holidays. Stay up to date on hours and after-hours options located close to campus. Stamps Health Services is an outpatient ambulatory care center that provides health care and health education to students and their spouses/domestic partners. Located in a state-of-the-art, 40,000-square-foot facility conveniently on campus. 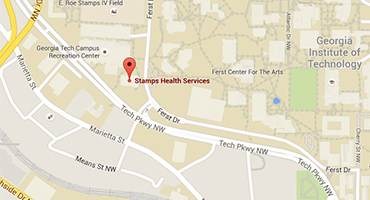 Find all Stamps Health Services policies and procedures conveniently located in one place. Stamps Health Services is staffed with board certified personel experienced in the treatment of the college-age student. Areas of expertise include general medicine, travel medicine, and acute injuries or illnesses, health education, pharmacy, diagnostic services, psychiatry and Women's Health. Our mission is to remain a nationally recognized model for college health care centers, in order to better support the Institute's educational mission my promoting the health and well-being of the Georgia Tech community. Stamps Health Services (SHS) is proud to announce their reaccreditation by the Accreditation Association for Ambulatory Health Care, Inc. (AAAHC). The accreditation provides reassurance for the Georgia Tech community that they will receive convenient, high-quality care when they need it and that the organization focuses on monitoring and improving quality of care. Stamps Health Services(SHS) is committed to providing high-quality care through an on-going process of self-evaluation, peer review, and education to continuously improve its care and services. Learn more about how SHS is committed to providing outstanding service.